A Year of FHE: LDS General Conference is Coming! LDS General Conference is Coming! 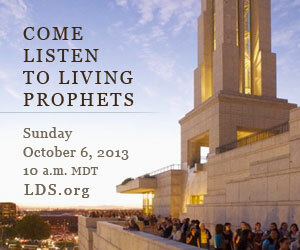 OCT O5 | LDS GENERAL CONF. *For the first time, the priesthood session will be available live in expanded digital channels, including LDS.org, Mormon Channel, and BYU Television. OCT O6 | LDS GENERAL CONF. Conference.lds.org: Video and audio in 16 languages. Mormonchannel.org and Mormon Channel mobile apps: Video and audio in English and Spanish. Mormon Channel YouTube platform: Video in English, Spanish, and Portuguese. Mormon Channel on Roku: Video in English, Spanish, Portuguese, French, and ASL. (Search for general conference under the “Spiritual” BYU.tv: Video and audio in English only. BYU.tv International: Video and audio in Spanish and Portuguese. Facebook.com/LDS: Video in English only.